The story of "Silken Thomas" has a moral and warning that resonates more today than ever it did in the 16th century. His rebellion began because of lies and rumour-mongering and his belief in it. In this world of social media where a Facebook post or a tweet can go viral in minutes how many lives have been ruined by an angry word, vindictive comment, jealous outbreak or the malicious behaviour of a troll. Mark Twain once said "The report of my death was an exaggeration" when he was confused in a newspaper report with his cousin – a sentiment that is shared by Axl Rose, Miley Cyrus, Betty White, Lil Wayne and Jackie Chan to name but a few of the celebrities killed of by social media rumour. The Dublin Penny Journal, Vol. 1, No. 5. "This sword of state is yours, not mine. I received it with an oath — I used it to your benefit — I should stain mine own honour if I turned the same to your annoyance. Now I have need of mine own sword, which I dare trust. As for the common sword, it flattereth me with a painted scabbard, but it hath indeed a pestilent edge, bathed in the Geraldine's blood. Therefore, save yourselves from us as from open enemies. I am none of Henry's Deputies — I am his foe. I have more mind to conquer than to govern — to meet him in the field, than to serve him in office." The irritation of the incensed lord was not assuaged by the speech that archbishop Allen made to stay him from his purpose. 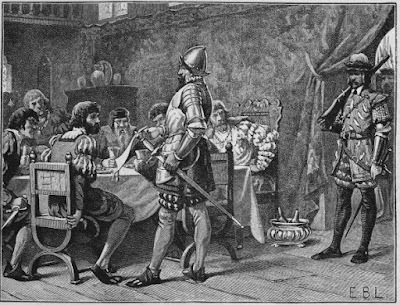 The entreaties he made use of were felt to be hollow — the tears he was seen to shed were considered to be crocodile's, and the Irish bard was not checked in his ill manners, who, while the prelate was delivering his laboured harangue, sung out his Irish verses in commendation of the bravery, the prowess, and the martial bearing of the Geraldine, whom he dubbed with the title of SILKEN THOMAS, because his numerous horsemen's accoutrements were gorgeously embroidered with silk. Here then we observe a curious and unheard of change in the character of an individual — at one moment Chief Governor of Ireland — at another, a rebel in arms, and for a time a vigorous aud successful one too. In vain the privy council sent orders to the city to have Lord Thomas arrested as he passed through the town: the citizens either could not or would not. On the contrary, so great was the success of the rebel, that the whole country was raised in his favour, the city supplies were cut off; it was placed in a state of siege; and the Archbishop and Baron Finglass obliged to shut themselves up in the castle, and stand to their defence. Lord Thomas seems to have left no stone unturned to secure success to his cause. He sent an ambassador to the Pope; another to the King of Spain with a present of hawks and hobbies; and lost no time in invading the territory of the Butlers, who remained faithful to the king; and in overthrowing the Lord Ossory and his adherents; he then returned to Dublin and proffered security and protection to the city, provided they would allow him to besiege the castle; this the citizens, with the concurrence of the constable of the castle, consented to do, but at the same time, to shew their loyalty, and that their hearts were not with the Geraldine, they amply provisioned the fortress, which Lord Thomas resented by encouraging the Tooles and Byrnes to ravage Fingal, the source from whence the city drew its supplies; the castle, then, being about to be besieged, the Archbishop afraid of the success of his bitter foe, got on board of a small vessel at Dames gate, with the hope of escaping to England; but the ship was stranded at Clontarf, and the prelate retiring to Artane, was in the middle of the night dragged out of bed, and, barefooted and almost naked, brought before Lord Thomas, before whom he fell on his knees and besought him for the love of God to shew pity on a Christian and an Archbishop. It is universally supposed that Fitzgerald, moved with compassion, and intending only to have the prelate imprisoned, cried out to the people in Irish, ber owm a buddagh — "Take away the clown," but the attendants wilfully misconstruing their master's words, beat out the bishop's brains, and thus committed as monstrous an act of sacrilege as Irish History records. It was observed that Archbishop Allen, as the perpetrator of sacrilege, deservedly became its victim; and that he who was the ready tool of Henry's spoliation of the monastic establishments in England, met in due recompense his murderous fate; at all events his assassins left a revenge on themselves, for the two actual perpetrators shortly died of most loathsome diseases, and we shall soon see the fate that attended Silken Thomas himself, his father, and all his uncles. The awful excommunication is still extant that was fulminated against these murderers; and the interdict was long held over the unhappy place where the murder was committed. In the meanwhile, Lord Thomas taking advantage of the citizens allowance to besiege the city, proceeded to plant his falcons (a species of cannon) against the castle, and it is likely he would have taken it, had not one of the city aldermen returned from London with a positive order from the king for the city to break faith with Fitzgerald; and to aid the garrison of the castle in driving him off from its walls. 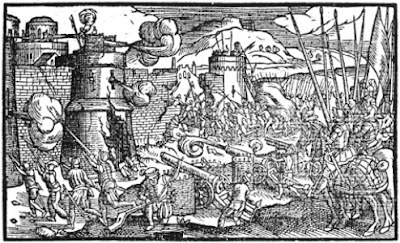 In revenge for this, Lord Thomas seized on the children of the chief citizens, who were at school in the country, and declared that he would place them in front of his men, exposed to the fire of the castle artillery. But the citizens, with Roman devotedness, refused any negociation with the insurgent, and prepared not only to defend the king's castle, but their own bulwarks against the common foe. Fitzgerald then attempted after cutting off the supply of water from the city, to besiege the caatle on the side of Ship-street; but was driven from his attempt by a wild fire invented by White, the constable of the fortress — which burned all his machines, and caused a fearful conflagration of the thatched and wooden houses that gave him sheltering. He then assaulted the city, by endeavouring to force the Newgate, which stood where Francis-street now joins Thomas-street. And having with his cannon pierced the gate, and killed some of the citizens inside, he was sanguine of an immediate surrender; but Richard Staunton, the gaoler of Newgate, (for this ancient bulwark was not only a city gate but a prison) seeing through a loophole, one of the gunners levelling his piece, not only fired, and shot him in the head, but he had the hardihood to rush out by the postern and actually strip the fallen foe of his arms and accoutrements. This inspirited the citizens so much that they instantly made a sally, and that with such success, that they forced Fitzgerald to raise the siege, leaving an hundred Gallowglasses slain, and their falcon in the hands of the citizens. Still Lord Thomas was not put down, for with an activity worthy of a better cause, he hastened to fortify all the Geraldine castles, especially Maynooth; he defeated at Clontarf a considerable force that had landed from England; his pirate, as he was called, Captain Rouks, was active and successful in intercepting supplies; and trusting to his friends amongst the gentry and nobility of the pale, and to the strength of his castles, he proceeded to Ulster and Connaught to strengthen his party — and to urge into active co-operation O'Neil and O'Connor. While absent on this expedition, the new Lord Deputy, Sir William Skeffington, having proclaimed lord Thomas a traitor not only in Dublin, but at the high cross of Drogheda, proceeded to besiege the Geraldine's principal fortress at Maynooth, and planting his battery on the park hill at the north side of the fortress, he summoned it to surrender; to which summons, as mine author has it, "a scoffing and ludibrious answer was returned after the Irish manner;" and therefore the siege went on, but with little success, for what with the bravery and good appointment of the garrison, and the ignorance that then prevailed in the use of artillery — for though the Lord Deputy, from having been master of the ordnance, was nicknamed the gunner, it would appear that he could make no great use in this instance of his guns — therefore in all probability the fortress would have held out until its master returned to raise the siege, were it not for the perfidy of the governor, Christopher Parese, whose name has descended to posterity along with that of Luttrell and Moriarty,* because he broke one of the strongest ties that can bind an Irishman, for he was the foster-brother of Lord Thomas — this "white-livered traitor resolved to purchase his own security with his lord's ruin;" and therefore sent a letter to the Lord Deputy, signifying that he would betray the castle, on conditions; and here the devil betrayed the betrayer, for in making terms for his purse's-profit, he forgot to include his person's safety. The Lord Deputy readily accepted his offer, and accordingly, the garrison having gained some success in a sally, and being encouraged by the governor in a deep joyous carouse, they became dead drunk; and sunk in liquor and sleep, the ward of the tower was neglected — the traitorous signal given, and the English scaled the walls. Captain Holland, being the first to enter, plunged into a pipe of feathers, and stuck there like a bird of prey that was caught in a pigeon house. Sir William Brereton got in after him, and shouted out "St. George, St. George!" whereat one of the guards awakening, observed Captain Holland floundering in the feather barrel, and fired at him, but the flying about of the feathers marred his aim, and he fell himself by the hands of the assailants. Sir William Brereton soon advanced his standard on the top of the turret; the stronghold was won — the garrison put to the sword — all except two singing men who prostrating themselves before the Deputy, warbled a sweet sonnet called dulcis amica, and their melody saved their lives. The spoil and plunder of the castle was immense, for being well appointed with all warlike munition, it was accounted the best furnished house belonging to any subject in the king's dominions. Parese expecting some great reward, with impudent familiarity presented himself before the Deputy, who addressed him as follows: "Master Parese thou hast certainly saved our lord the king much charge, and many of his subjects' lives, but that I may better know to advise his highness how to reward thee, I would ascertain what the lord Thomas Fitzgerald hath done for thee?" Parese highly elevated at this discourse, recounted even to the most minute circumstance all the favours that the Geraldine, even from his youth up, had conferred on him. To which the Deputy replied, "and how Parese couldst thou find it in thy heart to betray the castle of so kind a lord? Here, Mr. Treasurer, pay down the money that he has covenanted for — and here also executioner, without delay as soon as the money is counted out, chop off his head!" "Oh, (quoth Parese) had I known this, your lordship should not have had the castle so easily." Whereupon one Mr. Boice, a secret friend of the Fitzgerald, a bystander, cried out, "Auntraugh," i.e. "too late," which occasioned a proverbial saying, long afterwards used in Ireland — "too late quoth Boice." In the mean while Fitzgerald had got together, by the assistance of O'Connor, a considerable army, but his troops finding the stronghold taken, shortly after deserted, and though with considerable activity, great personal bravery, and no small mental resources, he shewed himself a dangerous Guerrilla enemy, and held possession of one of the strongest counties for such a warfare in Ireland, yet eventually he was induced to surrender to the new Lord deputy, lord Grey, and rode in amicable guise side by side with him, into Dublin; some writers say that lord Grey, before the Geraldine surrendered, promised him the King's pardon. 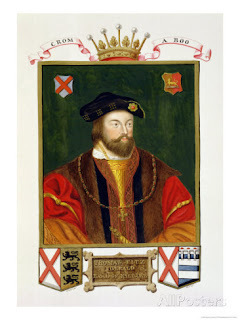 Others assert, that he gave himself up unconditionally — the result was, he was forwarded along with his uncles to England, through which he travelled as if under no accusation; but on their approach to Windsor, they were arrested as prisoners, and on February 3d, 1539, were all hanged at Tyburn. It is right to mention that Lord Thomas became Earl of Kildare before his execution — for his fathers hearing of his misfortunes, died in the Tower, prior to his son's surrender, of a broken heart. 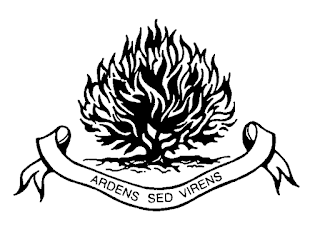 Before we conclude this narrative of the Geraldine, we must give the reader some account of the last male branch of the family, Gerald, who at the period of the catastrophe of his brother, his uncles and his father, was a boy of ten years of age, and had been luckily committed to the care and tuition of a good and faithful ecclesiastic, Thomas Leverhouse, afterwards Bishop of Kildare — he, on the apprehension of the uncles, took the boy in his arms, though in the full fever of the small pox, and wrapping him up warm, had him conveyed in a cleeve or basket into the fastnesses of Ophaly, and on his recovery carried him off to the county of Cork, to the Lady Elinor Fitzgerald, the widow of Mc Carty Riagh. She soon afterwards marrying O'Donnel of Tyrconnell, made it an article of her marriage settlement, that the northern chieftain should protect the Geraldine, which he faithfully promised but they were not a year in Ulster until he entered into a treaty with the Lord Deputy, to deliver up the boy, whereupon she shipped him off privately from Donegal to France, and when he was safe off, and provided with all the money she could procure, she then upbraided O'Donnel with his treachery, and told him "that nothing but the preservation of her nephew could have prevailed on her to marry such a clownish curmudgeon." Then, as he had acted as a false traitor, she would stay with him no longer; and she kept her word, for he nevar saw her more. The young Geraldine did not remain long in France, for Henry being at peace with Francis I., claimed his subject, so he had to fly into Flanders, and from thence to Italy, where he came under the protection of his kinsman Cardinal Pole; who it appears reared him well, and he did credit to his birth and education; for he did valiantly against the Turks in the service of the Knights of Malta, and became master of horse to the Duke of Tuscany. In this honorable service, as he was hunting in company with the Cardinal Farnese, he fell into a pit 60 feet deep, and had the good fortune, when within a few feet of the bottom, to catch some bushes, and gently descend on his horse, which lay dead at the bottom; here he stood for many hours up to his middle in water, and must have perished, had not his grif hound, missing his master, scented him to the pit, and then fell a howling, until the people attracted by the dog, came, and with a rope and basket drew him out. On the death of Henry VIII. he returned in disguise to England in the train of a foreign ambassador, and being at a ball, his finished manners, and beautiful person, captivated Mabel, the daughter of Sir Anthony Brown, Knight of the Garter, and marrying her, interest was made with the young monarch, who liberally restored him to his honours and estates. * Irish tradition records the name of the former as having betrayed the pass at the siege of Limerick — of the latter as having betrayed the Earl of Desmond. By Rev. ROBERT HUGH MORRIS, D.D. 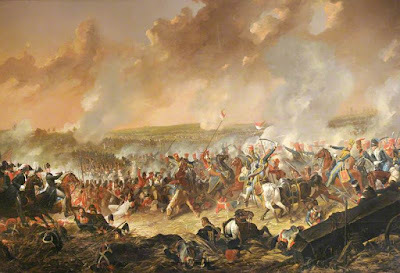 At the present moment [June 1915], when the nations of Europe are in the throes of a world-embracing war, it may be of interest to read the following impression of Waterloo, written by the Rev. Dr. Morris, of Philadelphia, about two years ago, on the occasion of a visit to that classic spot. It is also of some interest to Belfast Presbyterians from the fact of the recent announcement that May Street congregation propose to present a unanimous call to the talented author of the verses. All that it meant to die, but did not know defeat. Fell to their death where scarlet rivers flowed. And cannons roared above, and bullets shrieked their creed. Of victory ebb in one long wave of dark defeat. Who knows which dust was French, which English, in that strife? O God! And this is war! Ten thousand widows weep on England's shore. Whilst orphan'd children cry for those who come no more. Rule, Prince of Peace, from Thy high throne above. And end this reign of Hate, with all its murderous war. 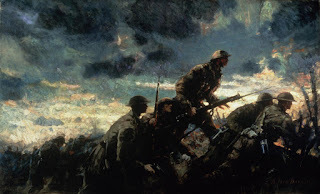 I was drawn to it, however, as the "pro-war" sentiment of the poem is unlike the more rueful and melancholy nature of most of the war poetry popular today. Into Battle has been described by Tim Kendall, President of The War Poets Association, as "second in popularity only to Brooke's The Soldier during and immediately after the War," but "is now either awkwardly ignored or explicitly condemned." I thought that if I was going to highlight this extract it was worth putting on the complete poem. The lark's fine anthem came. And the peace-song is heard. Comes all our ills between. Thunders that air have riven. 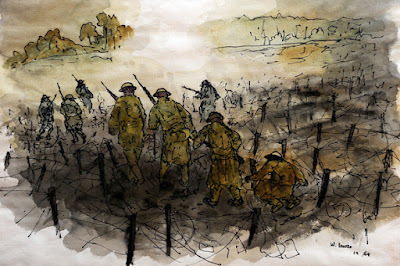 Image: WW1 drawing by Bill Lewis. 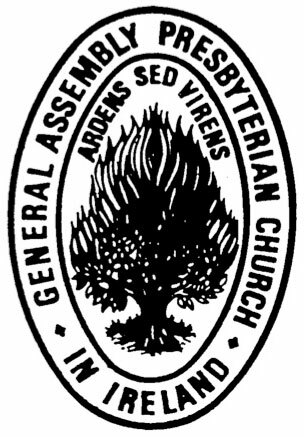 On Monday, 1st June 2015, the Presbyterian Church in Ireland will open their 175th annual General Assembly. 100 years ago the General Assembly of 1915 opened under much different circumstances. 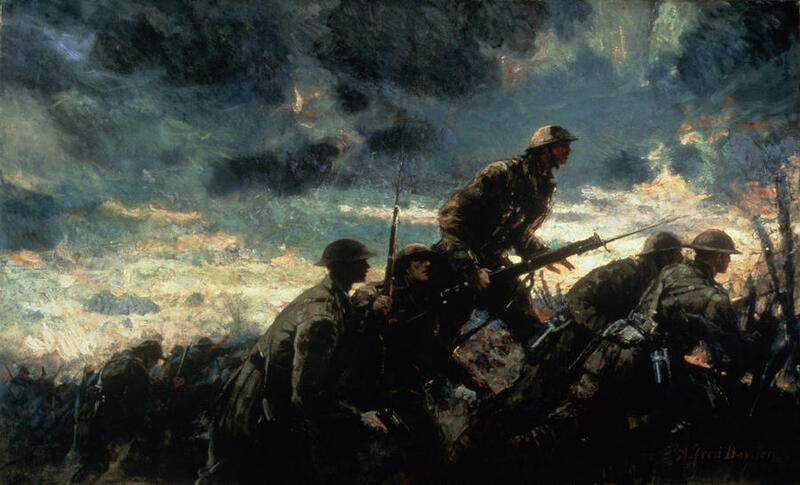 The euphoria of the call to war had long been tarnished by 10 months of fighting with names such as Mons, the Marne, Albert, Ypres, Givenchy and Neuve-Chapelle that still resound today. The Irish Division had been decimated at Gallipoli and the Ulster Division had just left for training and deployment. The slaughter of the Somme, Passchendale still unimagined. 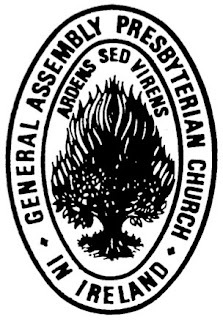 In the special intercessory service on the evening of the opening of the General Assembly a few minutes were devoted to silent prayer. During these the Moderator [Rev. Thomas Hamill, MA, DD] suggested at brief intervals supplications which might be offered. Subjects for intercession had been noted beforehand from which these were selected at the moment. They are printed below as they had been prepared, and are sent to ministers at the request of a number of those who were present. I. - FOR OUR NATION. That He would be gracious towards our Empire and its many peoples, making this time of sore trial to be rich in blessing to them all. That He would pour out of His goodness on our King and on the Queen and all the members of the Royal House. That He would give wisdom and strength to our Government and to all in authority, that what they do may be in harmony with His holy will. That He would work in our nation a deeper consciousness of sin, that in true penitence we may put away everything provoking His righteous judgment. That He would deliver us from all pride and false ambition, all covetousness and self-indulgence, and from the curse of intemperance. That He would enable us, however sorely provoked, to cherish the Spirit of Him Who on the Cross prayed for His murderers. That He would deepen throughout our Country and Empire the spirit of loyalty and patriotism, making us willing for every sacrifice. II. – FOR OUR ARMY AND NAVY. That He would grant to our Commanders guidance and insight, that with skill and success they may direct all operations on land and sea. That He would inspire all our officers and men with love of country and fidelity to duty, that in all extremities they may be brave and strong. That He would save our soldiers and sailors from every temptation, keeping them chivalrous, temperate, and pure. 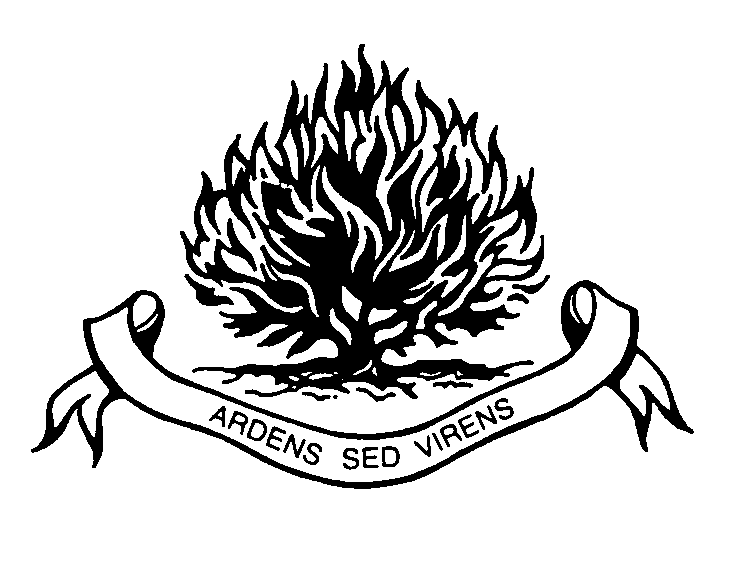 That He would give them patience and fortitude amid hardship and suffering, and defend them in the hour of peril. That He would be very near and very gracious to those appointed to die, granting them peace through faith in Jesus Christ our Saviour. That He would in mercy remember all prisoners of war, all maimed and made helpless for the work of life, all who cry to Him in distress and loneliness and fear. That He would fit for helpful service all ministering to our soldiers and sailors – all nurses, chaplains, surgeons – that they may never fail in gentleness and sympathy and skill. III. – FOR THOSE SERVING OR SUFFERING AT HOME. That He would fill us all with gratitude for those risking everything in our defence, and help us to remember them more constantly in prayer, and make us more worthy of their great sacrifice. That He would aid and prosper the efforts of all caring for the suffering and the sorrowing in the Home Lands, all trying to relieve poverty and distress. That He would sustain all at home troubled and anxious about loved ones in peril, and enable them to commit them to His Almighty keeping. That He would bind up broken hearts, and grant the holy comforts of His grace to all fathers, mothers, sisters, brothers, friends, bereaved by the War, especially to all widows and orphans. That He would draw closer together employers and employed so that setting aside mere personal and class interests they may work unitedly for our country’s good. That He would pour more and more of the Spirit of Prayer and of Consecration on our people, that the work of God in our midst and mission work everywhere may be greatly promoted. IV. – FOR OUR OVERSEAS DOMINIONS, OUR ALLIES, etc. That He would so order it that when the judgments of the Lord are, through this War, upon the Earth the people may learn righteousness. That in this land and in every land He would remember and visit with His grace the Churches of Christ afflicted by the War. That He would abundantly bless the Overseas Dominions of our Empire, who are so wholeheartedly making our cause their own. That He would through the War open a more effectual door for the Gospel among our fellow – subjects in India, many of whom are so loyally fighting in our armies. That He would pity and save those on the Continent who have been brought low in misery and ruin by ruthless invaders. That He would graciously awaken in our enemies the spirit of repentance, turning them from false ambitions and unjust aggression, and leading them to seek peace. That He would speedily grant victory to us and our Allies, such victory as may advance throughout the world that Kingdom which is righteousness and peace and joy in the Holy Ghost.